As professional PMP Converter, 4Easysoft Video to PMP Converter is specially designed for anyone who wants to enjoy movies on the Portable Media Player. 4Easysoft Video to PMP Converter accepts a wide range of video formats-FLV, VOB, MOD, XviD, AVI, WMV, ASF, MPG, MOV, etc, and output formats supported by Portable Media Player. 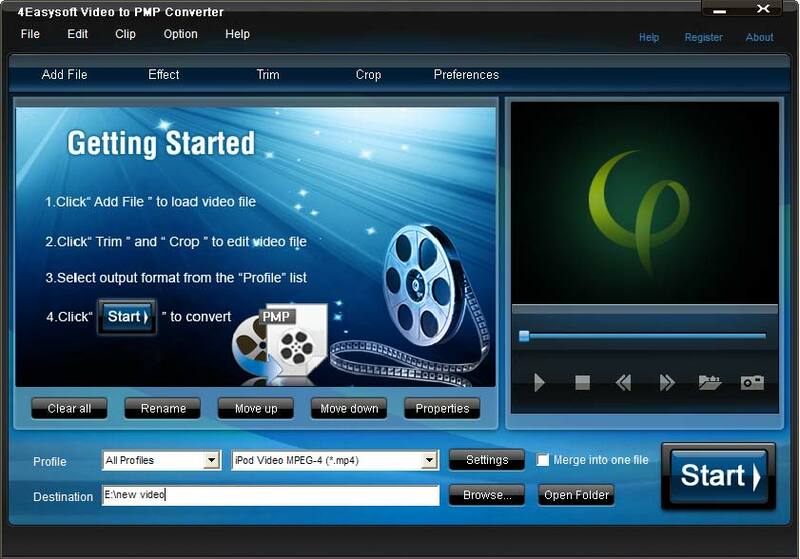 Furthermore, 4Easysoft Video to PMP Converter offers many advanced functions and options to customize the conversion. With user-friendly interface, this Video to PMP tool provides the easiest way to convert media to PMP player. You are able to convert all favorite movies into your portable video device and watch them wherever and whenever with this PMP Video Converter. 4Easysoft MP4 Converter is an easiest-to-use MP4 Video Converter which is designed to convert almost any video formats to MPEG-4 standard formats. This MP4 Converter provides a powerful way to convert video and audio files to MP3, M4A, AAC, AC3, OGG, WAV, etc. 4Easysoft Video to PMP Converter can convert all the regular formats to MP4 PMP, MPEG-4, H.264, MOV, AVI, WMV, 3GP, 3G2 video and MP3, AAC, M4A, WMA, WAV, OGG audio formats. 4Easysoft Video to PMP Converter can convert your video to a widely range formats with only one time conversion. 4Easysoft Video to PMP Converter can convert media to various PMP devices, such as iPod, iPhone, iPod touch, iPod nano, iPhone 3G, Apple TV, PSP, Walkman, Creative Zen, iRiver, Archos, Zune, Xbox 360, BlackBerry, Sony Ericsson, Gphone, Nokia, Samsung, Motorola and so on. This Video to PMP Converter enriches your video to PMP conversion in the way of a wide variety of video editing functions such as adjust video effect, crop video, trim movie, join video and take snapshot. This 4Easysoft Video to PMP converter affords you a widely choices of watermarks to attach on your video. Beautify you video with sorts of subtitle and at the same time get your Audio track. With professional video encoding and decoding technique, 4Easysoft Video to PMP Converter brings you the advanced and high speed converting process. On the other hand, this PMP Converter has the magic charm to impress users with best video quality. This product can output different formats for your video simultaneously. Adding different watermarks to your video,increase surprising visual effects. Personalize your video with additional subtitle and Audio track function.